Texans are busy and making breakfast or lunch at home sometimes isn’t a viable option. 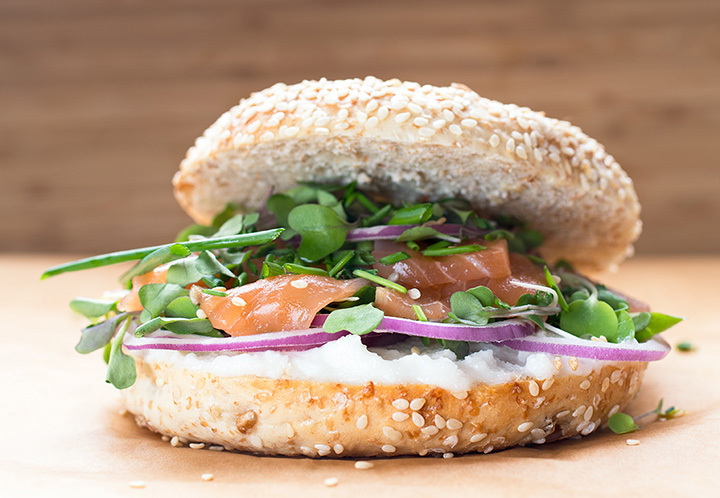 When you’re on the road and need a light meal, you won’t do better than a freshly-baked bagel. Get yours with cream cheese or simply buttered, and dig in for a delectable bite. The Bagel Shop offers four unique locations in El Paso, Texas, serving up freshly-made bagels on a daily basis. Get yourself a sandwich, served on your choice of a bagel or loaf of bread, and choose from 20 different bagel options. If you’re looking for a unique experience, the Green Chili and/or the Orange Cranberry bagels should fit the bill. Bagel Express and Delicatessen has been in business for over 25 years serving the sweet people of Sugar Land. Bagel Express offers breakfast and lunch options, along with omelets and French toast made from bagels. Consider Bagel Express to cater your next event. The Bagel Café in Katy, Texas, provides breakfast and lunch every day of the week. Try their bagels, cream cheese, sandwiches, pastries, breads, holiday pies, and more. Twenty-four staple bagels are on the menu every morning, including the interesting spinach feta cheese and banana walnut bagels, whereas seasonal bagels like pumpkin and gingerbread are available during certain times of the year. Cindi’s, now with five locations, was awarded the 2014 “Best Breakfast and Brunch” award by the Advocate. The breakfast menu is served all day, along with New York Ruebens, Philadelphia cheese steaks, egg salad, tuna melts, and more. The bakery pumps out fresh challah and rye break in addition to the bagels. All your favorite go-to bagels are present. Come on in to any of their four Dallas locations or their location in Carrollton today. Boopa’s Bagel Deli has made authentic water bagels, boiled in water, every day for the last 17 years. Choose from nineteen unique bagels, including Sun-Dried Tomato, Salt, and the “Boopa” (sweet everything), along with 14 different cream cheeses. Breakfast and lunch is served, too. Ask about their 5 and 10K marathons. Wholy Bagel “Keeps Austin Baked” with their made-from scratch bagels, prepared every night and boiled before baking. Fourteen different bagels make up the bulk of the menu, including Jalapeno Cheddar and Bialy. Add one of 14 cream cheeses, and make sure to ask about their seasonal cream cheeses. Katz coffee comes in Columbian, Bat City, and Ethiopian Harrah blends. Lunch specials are available every day. Bagels Place in Amarillo, Texas, has an absolutely delicious pizza bagel. It comes open-faced and is topped with pizza sauce, provolone and parmesan cheese, and your choice of pepperoni, ham, Canadian bacon, black olives, tomatoes, or capers. It’s like a bagel bite except, you know… regular sized. If that’s not enough for you, they’ve got twenty other bagels on the menu, including cranberry apple, snicker doodle, and butterscotch. Check out the rest of their baked goods, soups, salad, and breakfast menu, too. Bite the Bagel Deli Café now has two locations, one in Killeen and one in Harker Heights, Texas. They are the self-proclaimed “best place in town for fresh baked bagels, Italian bread, premium deli sandwiches, subs, soups, gourmet salads, specialty coffees, and desserts.” You’ll find all the original favorites here, including plain, sesame, honey wheat, and cinnamon raisin, along with all-day breakfast sandwiches, subs, and lunch sandwiches. Check out their menu for up to date nutritional information. New York Bagel Café and Deli, with a location in Spring, Texas, brings all of the authentic flavors of a New York style bagel to Texas. Try from fourteen different bagels, including “Energy” bagels and Bialys, nine different cream cheese spreads, and much more. New York Bagel Café is available for catering. Call ahead or check their website for a complete menu.